KAMPALA – President Yoweri Kaguta Museveni has urged district leaders to change the mindset of their people to concentrate on poverty eradication at household level. The President was handing out dummy cheques to youth and women groups operating projects under the Uganda Youth Livelihood Programme (UYLP) and the Uganda Women Entrepreneurship Programme (UWEP). Youth from 26 districts received dummy cheques worth over Shs8 billion for the 915 targeted projects, while women groups from 43 districts received over Shs9 billion targeting 1,459 projects. 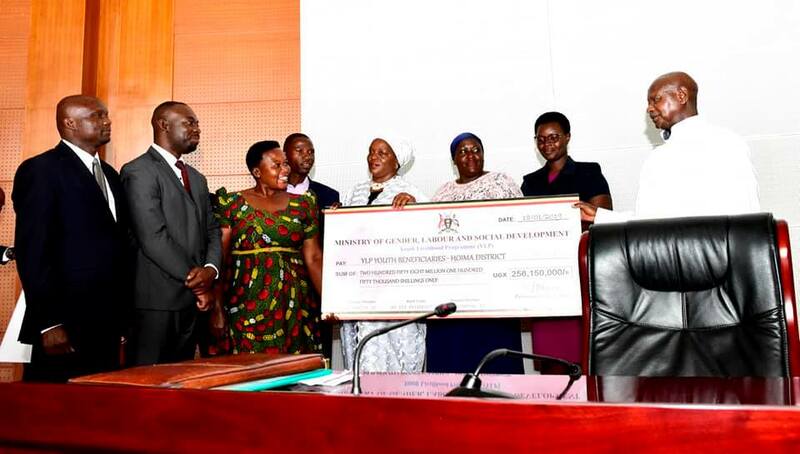 District Local Government leaders, as well as chairpersons of the women and youth groups, received their cheques at a function held at the Parliamentary Buildings in Kampala. Museveni applauded the exemplary work of the groups that exhibited their value-added products, at the function. Rulembo Youth Leather Products from Kisoro, for example, tan leather exhibited good quality shoes they produce..
“Those are jobs. We need to do more of that. The skin is tanned and shoes made or even car seats,” the President observed and called for a movement of import substitution and export promotion. On the issue of budget allocation to youth, Museveni emphasized the need to first improve the equipment of the Army, re-launch the country’s Airline and increase funds for Operation Wealth Creation. “Let’s not encourage bad planning and squander our resources. The country spends $450 million on foreign travels and yet coffee alone fetches the country $500 million. If we have discipline and reduce on expenditure and foreign travels, we can increase OWC funds. I am glad some people have woken up and embraced commercial farming,” he noted. The Minister of State for the Youth, Hon. Nakiwala Kiyingi thanked the President for prioritizing the skilling of the youth and women. She pointed out that it is only him who has come out to support women and youth groups unlike in several countries worldwide whose women and youth are funded 80% by NGO’s.